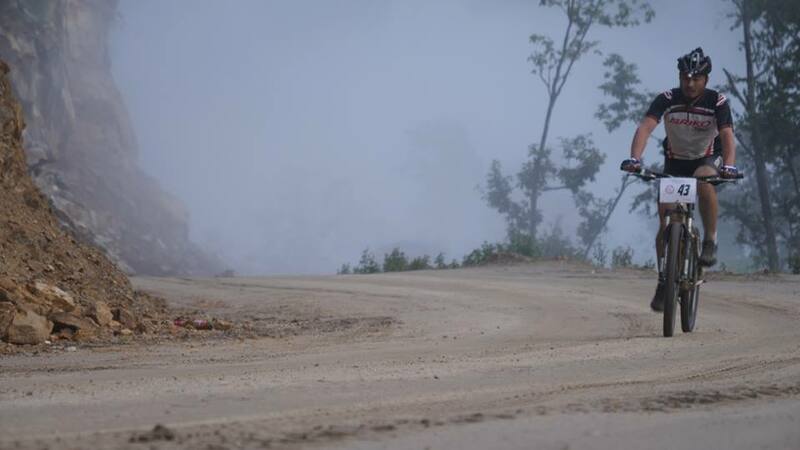 Tour of the Dragon is not a road bike race or a classic mountain bike race, nor is it a gravel grinder, because it doesn’t fit into any of the categories defined by the International Cycling Union. Since the distance of the race is 200+ km, we would categorize it as an ultra-marathon mountain bike race on roads that happen to be extremely challenging. Tour of the Dragon starts in Bumthang (Saturday, September 7th, 2019, 2:00 AM,) and travels 268 km over 4 mountain passes before finishing in Thimphu town square. It’s one of the toughest one-day mountain bike races in the world. This unforgettable adventure begins in Paro, where you’ll arrive from your international flight, passing over spectacular mountain terrain. 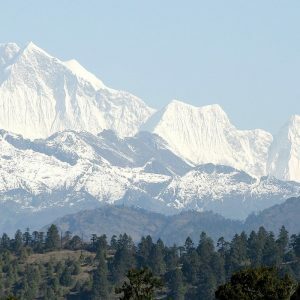 At 7,410 feet elevation, you can enjoy cool, clean air and 360-degree views of Himalayan peaks, including Mount Everest and Mount Chomolhari. After meeting your guide check into your hotel and after lunch visit you’ll visit Ta Dzong – an old watch tower converted into the National Museum of Bhutan, Paro Dzong, Kyichu Monastery and later in the evening enjoy a stroll through the streets of Paro. 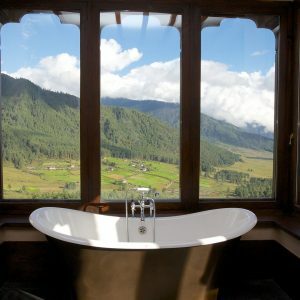 Overnight in Paro at Dewachen Resort & Spa or Gangtey Palace or similar. After breakfast depart for exciting hike to the Tiger Nest Monastery. The monastery, is perched some 2,000ft ,600m up on a sheer cliff overlooking the valley and was said to be where the legendary Indian saint, Guru Padmasambhava, flew from Tibet on the back of a tiger to defeat five demons, who were opposing the spread of Buddhism in Bhutan. The hike is about 1 & 1/ 2 hours to the teahouse, from where you may either opt to go further uphill to the monastery for about 1 hour. Lunch is served at the tea house with the majestic views of Taktsang above and the Paro valley at the bottom.Arrive in Paro and visit a typical Bhutanese village home. 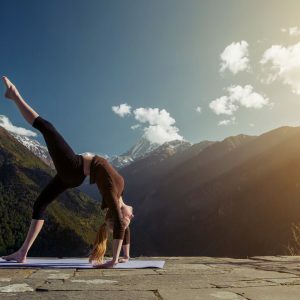 This visit will certainly provide you an insight on living style of Bhutanese villagers with an opportunity to try Traditional Bhutanese Hot Stone Bath and a cooking demonstration will be performed for you to get idea on how Bhutanese delicacies like BUTTER TEA and EMA DATSI are prepared. Later in the evening drive to Thimphu and enjoy 30 minutes massage complimentary at Pedling Hotel & Spa , Thimphu. Day 4: Friday 30th August 2019: Thimphu- Finalize bike gear for race. After breakfast we will have 1 hour meeting to discuss about our program, followed by medical checkup and also this will be our day to store bike cases, rent bikes or acquire any last minute bike gear at local bike shops prior to our drive to the start line. The Takin Reserve and return to the hotel. After breakfast visit Changangkha Lhakhang, the Institute of Traditional Bhutanese Arts and Crafts, the institute of Traditional medicine, National Library and the Centenaray Farmers market. After lunch bike thorough the Wangditse- taba-Tago Cheri base trail and return to hotel. Dinner in the Hotel & Overnight in Thimphu Pedling Hotel & Spa or Galingkha Hotel. We will ride to Punakha through the most well known pass -Dochula Pass, located about 30 km away from the capital of Bhutan, Thimphu. The 108 chortens at Dochula were built by one of the Queen Mother’s to honor the Bhutanese soldiers who were killed when fighting the Indian rebels in 2003. Though Bhutanese have wanted to build these chortens to mark the victory of the Bhutanese army, the King has rejected this offer and instead uses the chortens to commemorate the deceased. Lunch at Lobesa and in Punakha visit Punakha Dzong and Chimi lhakhang Monastery. Overnight at Zhingkham Resort or Hotel Lobesa or Hotel Vara. Day 7: Monday 2nd September 2019: Punakha to Phobjikha Valley area via Dochula Pass. Once we leave Thimphu on our drive to the start line of the TOD, we will be heading backwards on the TOD course, so you will have an opportunity to experience the course in full while preparing for the race. After breakfast ride towards Phobjikha Valley This valley is a broad glacial valley (10’000 ft) on the flanks of the Black Mountains, Phobjikha with it’s gently slope is a place of astonishing beauty described as” the most beautiful valley in the most beautiful country of Himalayas”. Every winter, the rare and beautiful black-necked cranes return from Tibet to the Gangtey valley where they are protected. Gangtey also has a very interesting and ancient Nyingmapa monastery, the only one of its kind west of the Black Mountain range. Visit Gangtey Gompa Monastery( more than 450 years old). Gyaltse Pema Thinley, the grandson and mind reincarnation of Pema Lingpa founded the Temple in 1613, and Tenzin Legpai Dhendup, the second re-incarnation, built the temple. The present Abbot, Kunzang Pema Namgyal is the ninth re-incarnation. Later in the evening join the monks for 1000 butter lamp offering and a prayer session to remove all obstructions, negative karma and wishing for peace & harmony of all sentient being on earth. Day 8: Tuesday 3rd September 2019: Drive from Phobjikha to Bumthang – The Race Site. After breakfast you thave the option to ride your bike or hop onto the bus on a drive towards Bumthang. On our drive we can relax and enjoy more of the TOD route and Bhutan’s stunning geography. Just before the long horse shoe descent and ascent into Trongsa we’ll catch a view of the impressive Trongsa Dzong perched on a cliff-side across a huge chasm. This Dzong is one of the most magnificent works of traditional Bhutanese architecture in the country. 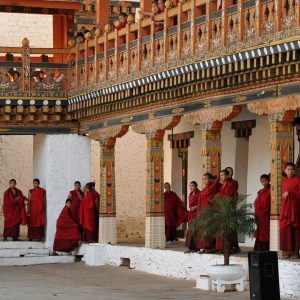 The Dzong was originally built in 1644 and enlarged at the end of the 17th century. If we have time and a bit of energy we can then take a hike up the hill to the watch tower museum where we’ll get expansive views of the surrounding area. 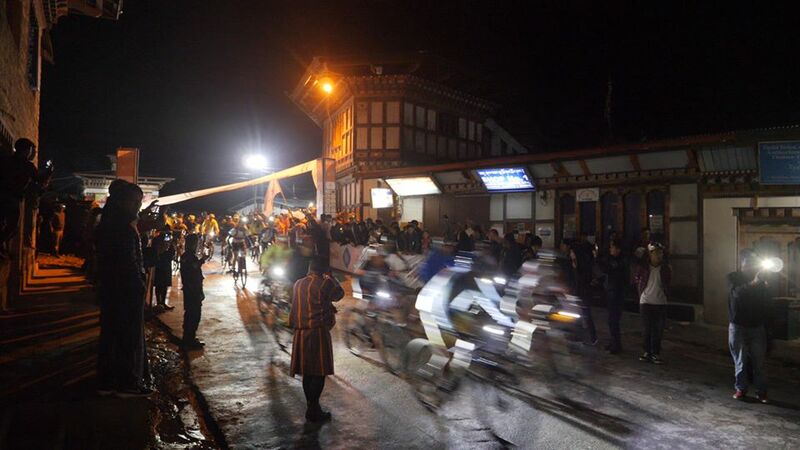 Bumthang Valley and the sprawling town of Jakar, is the location of the start of the Tour of the Dragon. In Bumthang visit Kurjee Monastery, Jampel Lhakhang and have Lunch in Bumthang Farm House and after llunch visit Cheese Factory factory and ride in and around bumthang town or relax in the Hotel. After breakfast ride towards Tang valley and visit Maebar Tso and Tang Nunnery. We will join the nuns for a one hour chod program- a prayer or ritual performed to cut through the five defilements (anger,greed,ego,lust and attachement). After lunch ride back to Bumthang to attend Riders Briefing from 3:00-5:00 PM with an audience with HRH Prince Jigyel Ugyen Wangchuck [the exact time will be announced]. Meet with His Royal Highness, the President of the Bhutan Olympic Committee, bike around town, and nap in preparation for late night start of the upcoming race. Day 12: Saturday 7th September 2019 TOUR OF THE DRAGON START! Finish line in Thimphu. 6:00 PM Final cut-off time at Dochula Pass. If you make it to Dochula by 6:00 PM you are allowed to continue to the finish line. All awards will be given at the awards ceremony on September 7th, 2019 at 7:00 PM onward. Venue: Clock Tower Square, Thimphu. Tour of the Dragon cash purse and additional prizes will be offered to the participants. Dinner in the Hotel. Overnight at Pedling Hotel & Spa in Thimphu. Enjoy Complimentary 30 minutes Riders massage in the hotel spa. Day13: Sunday 8th September 2019: Rest day and touring in Thimphu. Today is our last day to shop or view a Thimphu highlight that we missed on our prior day here. Lots of options available. Ovenight at Dewachen Resort & Spa or Gangtey Palace or Similar Stadnard. 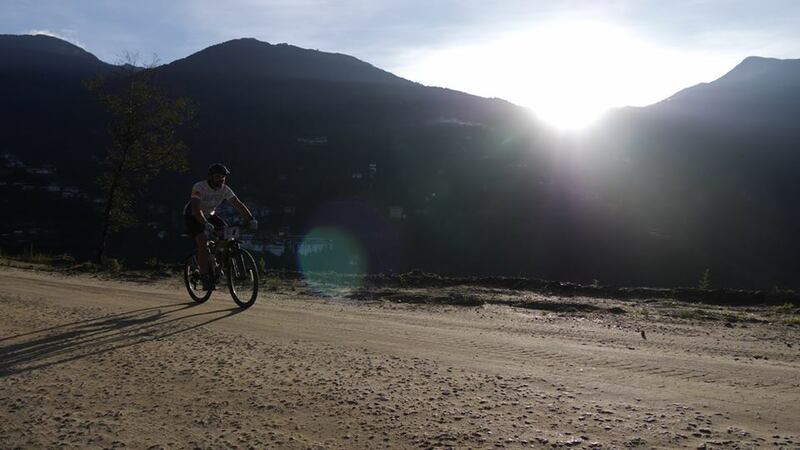 Tour of the Dragon starts in Bumthang, central Bhutan (2610 m, 8560 ft), and takes you to Thimphu across 4 mountain passes, or las as they are called in Dzongkha.The riders follow the Bumthang Chhu (river in Dzongkha) for a couple of kilometers and then climb 6 km through blue pine forest to Kiki La at 2870 m (9420 ft). From there it is down to Nangar. Through more blue pine forest and agricultural land you follow a gentle road through Chumey and up to Gaytsha (2950 m, 9680 ft). The road then climbs 7 km up through blue pine forest to Bong Bridge, and then gets a little steeper for about 5 km through mixed conifer and rhododendron forests and pastures until you reach Yotong La at 3430 m (11250 ft). From Yotong La it is a 29 km downhill ride to Trongsa. The pass is dominated by fir and rhododendron forest, open pastures and rock outcrops. As you go down to Dorji Gonpa, which is almost halfway, firs give way to spruce and hemlock and mixed broadleaved forest dominated by birch and oaks and rhododendrons. Below Dorji Gonpa, the road passes though broadleaved forest and agricultural fields. There are some excellent viewpoints to see in Trongsa, including the dzong (fortress) and the extensive forests and agricultural fields beyond. Just before reaching Trongsa (2150 m, 7050 ft) you pass right below the Ta Dzong (a watchtower to guard the dzong from enemies). From Trongsa the road descents gently for 7 km to the Bjee Zam bridge at 1900 m (6230 ft) and then climbs 6 km through broadleaved forest to a viewpoint from where the Trongsa Dzong seems just a stone’s throw away. The road continues climbing for another 10 km along cliffs and through broadleaved forests and agricultural settlements. At Tshangkha it passes the headquarters of the Jigme Singye Wangchuk National Park. After reaching Tashiling, a few km further, most of the climbing is done. For the last 20 km you will only climb some 150 m (500 ft), but there are some ups and downs. As you near Chendebji, hemlock replaces broadleaved species on some of the ridges and in the valley. You pass Chendebji Chorten and a little later will reach Chendebji village (2430 m, 7970 ft). The road climbs through mixed conifer forest past Nikachu bridge at Chazam and Rukubji to the small settlement of Longte. By this time most of the trees have been replaced by pastures and agricultural fields. Through these pastures dominated by dwarf bamboo you reach Pele La (3430 m, 11250 ft). You then continue your long descent through fir, birch, rhododendron forest and many small waterfalls to Wangdue Phodrang. After passing the village of Nobding, there is a single restaurant a further 12 km down and then a few shops at Teki Zampa another 15 km further. Just past here a new Japanese bridge spans the Dang Chhu. At Chuzomsa, there is a side road to an abandoned slate mine. After a long, almost flat stretch you reach Wangdue Phodrang. From Wangdue Phodrang, you continue to Metshina (1410 m, 4625 ft). From Metshina, the distance to Dochula at 3150 m (10,330 ft) is 38.3 km and the race is all uphill, with an average slope of 5% and a few short sections of up to 10%. You will pass Thinleygang (11 km), Lumitsawa (15km), Lampiri (28km), and a memorial chorten for traffic accident victims (32km). Thinleygang is the only place recognizable as a village, having a couple of shops and a BHU (Basic Health Unit). Racing 1700 m (5575 ft) uphill is as breathtaking as the views. Aid stations are located approximately 20Kms apart. Aid stations will feature water, fruit, and other nutrition that will be announced prior to the race start. There will be mile markers at each aid station.All riders are encouraged to carry a water bottle and any other necessary or needed personal food supplements between aid stations. There will be six mobile aid cars roving along the route with food supplements basic medical kit and one technical personnel for minor bike repairs. You can get support at aid stations, but it is prudent to not count on the roving vehicles as it is impossible to know where they will be when you need them. Traffic will be open to vehicles, but will be monitored by local police and transportation officers. 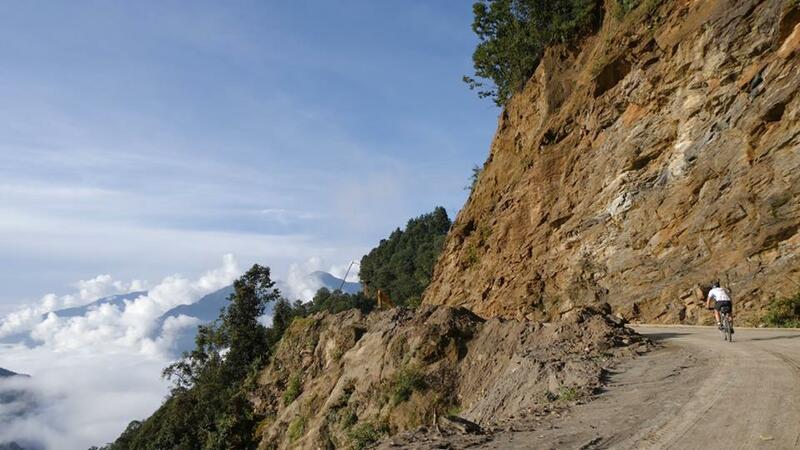 Most of this route is on the national highway in Bhutan, so vehicles will be on the roads. Medical personnel will be available at the start and finish line as well as roving on the course. There will be an ambulance on standby. Bhutan is a land of high mountains and deep valleys, and the 270 km route demands 8,000 meters (26,000 feet) of climbing. This is completely absurd. The hardest stages of the Giro d’Italia or the Tour de France usually cover 5,000 meters (16,400 feet) of climbing in a day, and that is on ultra light, super fast road bikes on perfectly paved roads. So 8,000 meters of climbing is a massacre. It’s basically riding to the top of Mt. Everest from sea level. In a single day. Tour of the Dragon is way up high in the Himalayas, with an average altitude around 3,000 meters (9,800 feet). There are no flat spaces in Bhutan, and the mountains are extremely steep. The road is a feat of engineering carved out of the side of these majestic mountains. Since it was the end of monsoon season with lots of rain still falling, we were dealing with landslides and mud—a whole lot of mud. Then, there was the added danger of zero guardrails, so falling meant certain death. The entire course is without question, a no fall zone. Mountain weather is always unpredictable, especially during monsoon season. This was going to make the race even more difficult, as the temperature difference over the course of the day could be up to 70 degrees F (21 C) or more, including heavy rain. Selecting the right clothing is crucial, as you can overheat on the ascents and get so cold on the descents that you can’t feel your hands. The right food is 50% of a ride such as this. One also does not want to start switching food two weeks before or during the race. You need to bring medicines and supplements . ** Riders need to cross Dochula Pass by 6 pm. If not, the sweep team will pick you up. After the cut off time all resources such as volunteers, marshals, aid stations and officials will not be available to riders who insist on completing the race the rider after the cut off time. Extra Cost will be applicable & will be charged as per the rates quoted by the respective hotels. Extra Cost will be applicable based on the choice of the 5 Star Luxury Hotels & will be charged as per the rates quoted by the respective hotels.